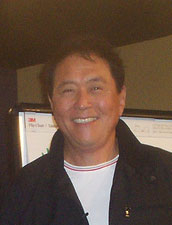 Robert Kiyosaki. Photo by Casey Serin. 7PM THURSDAY, APRIL 11 Robert Kiyosaki: Why 'A' Students Work for 'C' Students Bestselling Rich Dad, Poor Dad author Robert Kiyosaki visits with his new book Why 'A' Students Work for 'C' Students: And 'B' Students Work for the Government. Kiyosaki discusses his belief that the national school system was designed to do little more than churn out employees—'A' students who read well, memorize well, and test well—but not creative thinkers, visionaries, and dreamers who could be entrepreneurs in the making. He urges parents not to be obsessed with letter grades. Instead, he advises that they focus on concepts and ideas, and on helping children find their own special gifts, which could put them on a path they can pursue with true passion. He also highlights several 'C' students who grew up to be phenomenal successes—entrepreneurs who went on to hire 'A' students (attorneys, accountants, and other school-smart specialists) to work for them, leaving 'B' students to find unfulfilling work in government-type jobs. Not surprisingly, Kiyosaki coins his own definitions of what 'A,' 'B,' and 'C' really stand for as he offers parents and young people insights and tools for navigating an ever-changing business world. EVENT DETAILS Event ticket (admits two) is free when you purchase Why 'A' Students Work for 'C' Students from Changing Hands Bookstore. Letter groups (printed on top of ticket) will be called at 6pm to fill seats and designated standing room. If available, seating and standing room opens to those without tickets at 6:45pm. Space cannot be guaranteed for late arrivals. Booksigning line forms by assigned letter group after the presentation. Those without tickets may get their books signed after ticket-holders, if time allows Event details may be subject to unannounced changes. ABOUT THE AUTHOR Robert T. Kiyosaki, best known as the author of Rich Dad Poor Dad — the #1 bestselling personal finance book of all time — has challenged and changed the way tens of millions of people around the world think about money. He is an entrepreneur, educator and investor who believes the world needs more entrepreneurs. With perspectives on money and investing that often contradict conventional wisdom, Robert has earned a reputation for straight talk, irreverence and courage. Robert T. Kiyosaki , Rich Dad's Escape from the Rat Race: How to Become a Rich Kid by Following Rich Dad's Advice. Robert T. Kiyosaki is currently considered a "single author." If one or more works are by a distinct, homonymous authors, go ahead and split the author. Robert T. Kiyosaki is composed of 9 names. You can examine and separate out names.